When Star Wars Day comes around (that's May the Fourth for those unfamiliar), I like to share some kind of Star Wars creation. Because I just love combining a bit of classic sci-fi with some DIY. 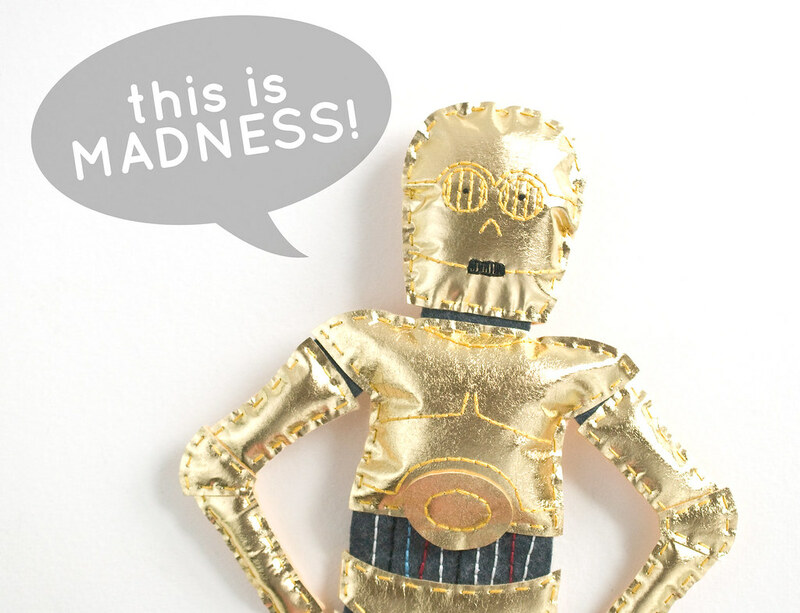 And so this time around, I'm here with a pattern to make a soft C-3PO figure with metallic felt. Metallic felt, you say? Yes indeed. It looks like metallic vinyl or even leather, but this is all felt. 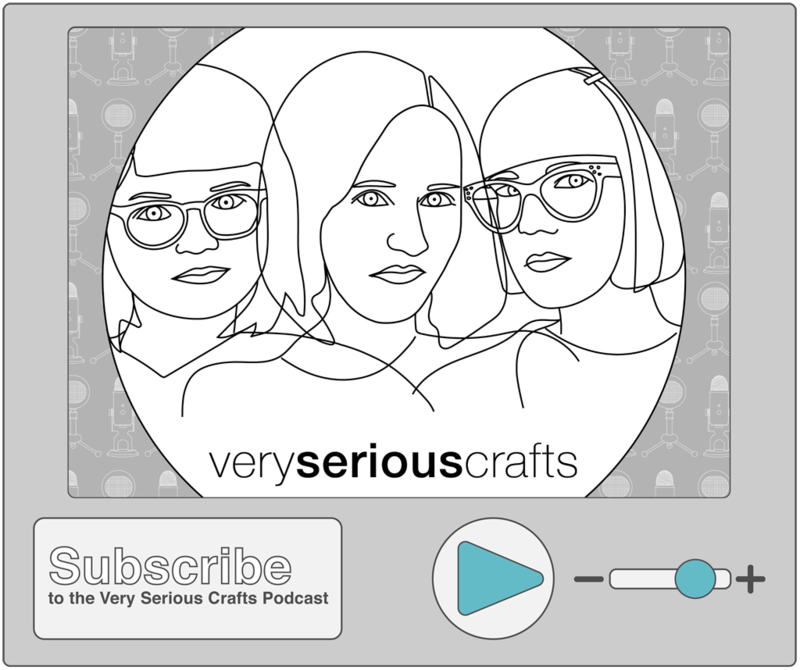 My idea for this project started with the felt stormtrooper doll (inspired by Rogue One), which I made earlier this year. 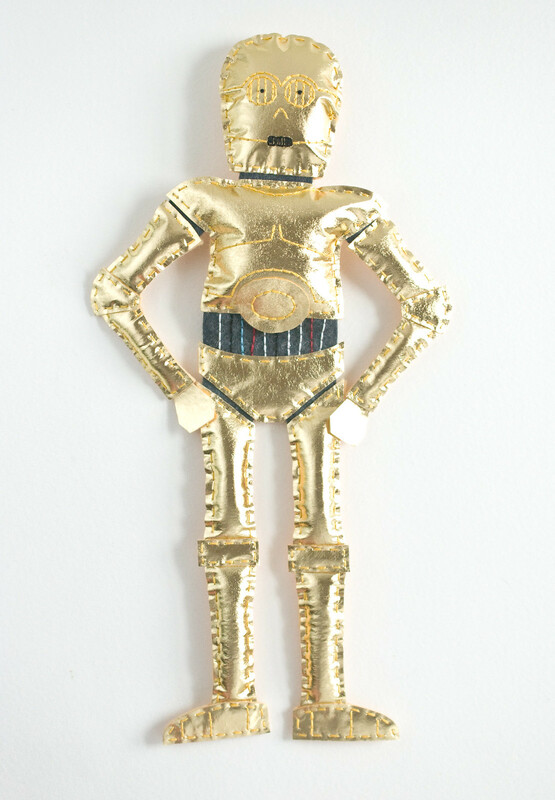 I realized that the construction would work well for a droid like C-3PO. 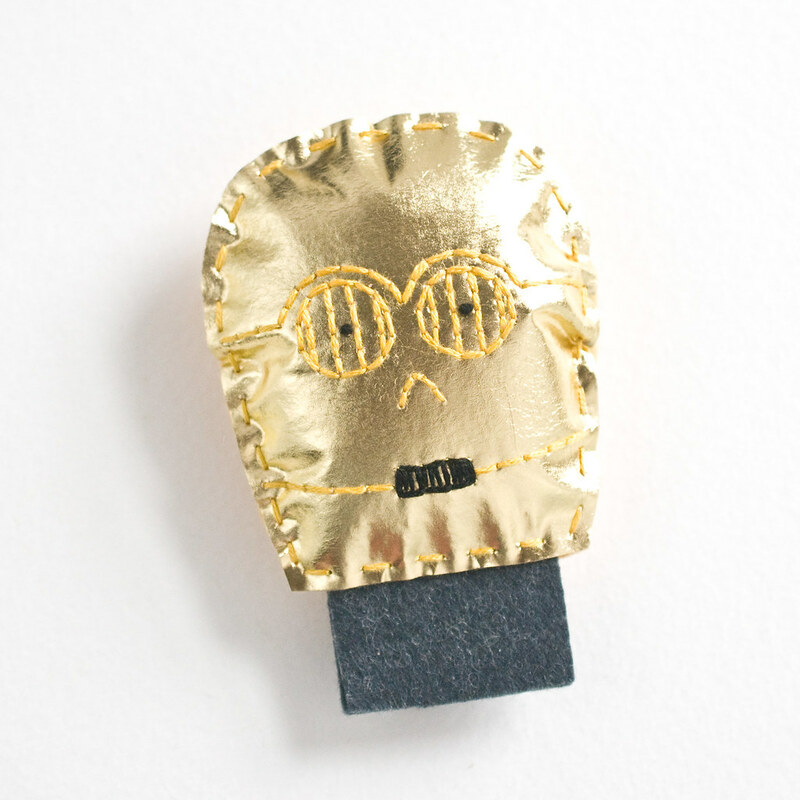 And then I remembered that I had some gold metallic iron-on material from Benzie Felt. This was the perfect opportunity to try it out! 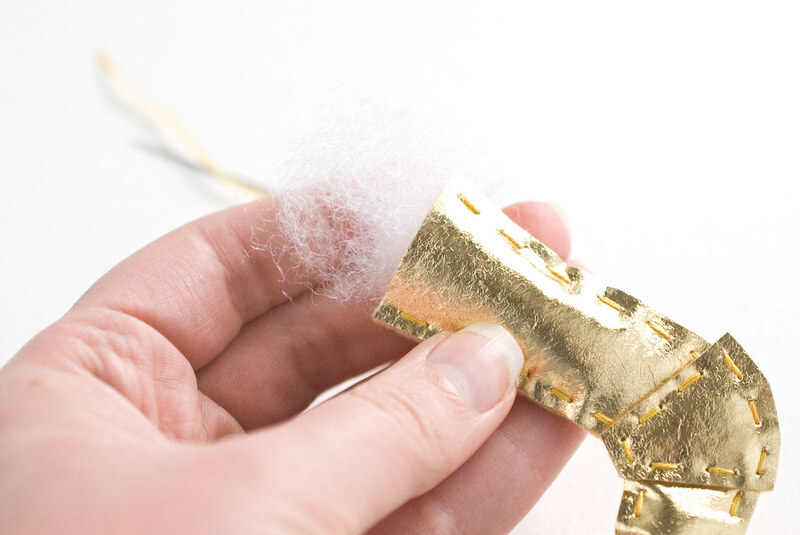 Follow Benzie's instructions for ironing the metallic gold material to the felt. She recommends working with smaller pieces, which I did. To do this, I estimated some small sections based on the pattern pieces. 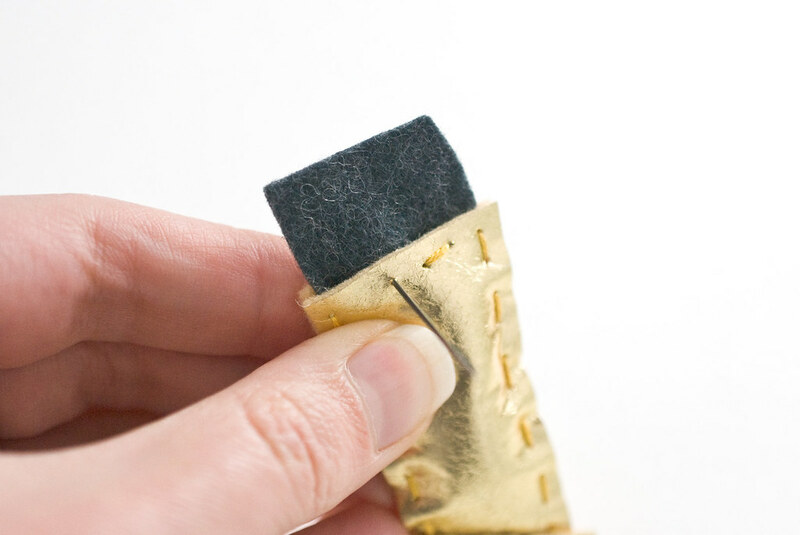 You'll know that it's fused to the felt when the texture changes from shiny to more leather-like. Peel away the clear protective layer. When cutting the pattern pieces, you can't use pins to hold the templates to the metallic felt, as they'll leave holes that will be visible. 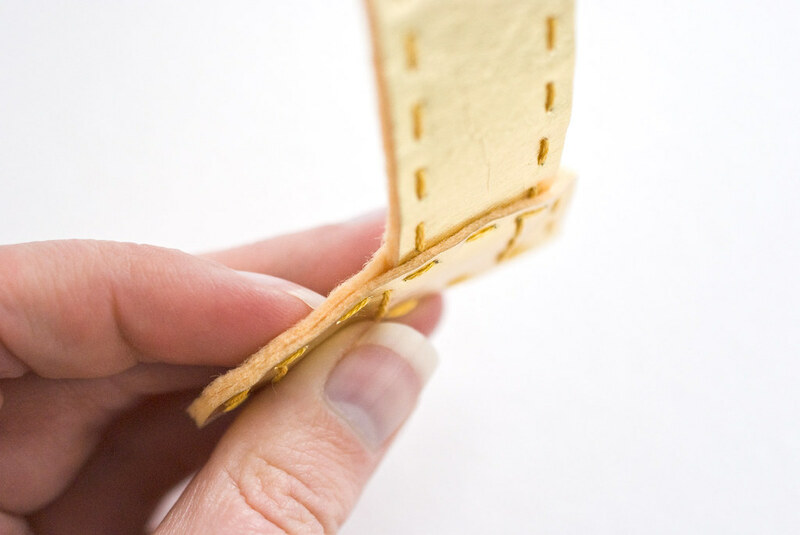 Instead, attach the paper templates to the surface of the felt with rolls of removable tape. 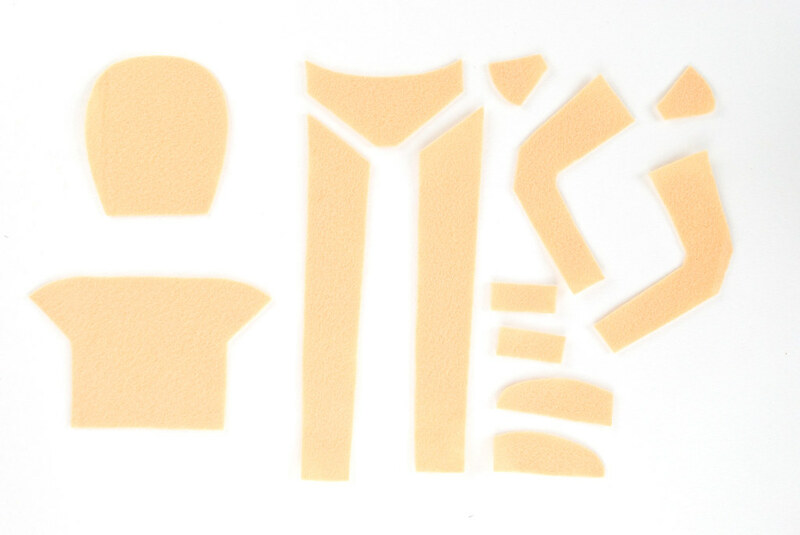 Cut all of the pieces shown above from metallic gold. 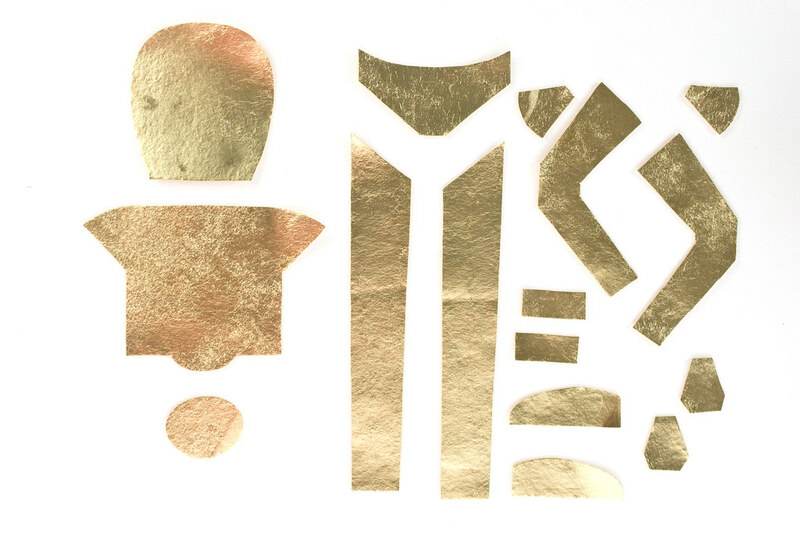 Cut all of the pieces shown above from non-metallic golden felt. Note that the torso piece here has the rounded section squared off, but it's easier to assemble if you leave the rounded section as it is on the pattern piece. Basically, these are all duplicates of the metallic pieces, but you won't need to cut hand pieces from this. You also need to cut two connection pieces for the neck (the square-ish piece) and the stomach (the piece with the lines on it), as well as the two shoulder connectors (squares with one rounded edge). 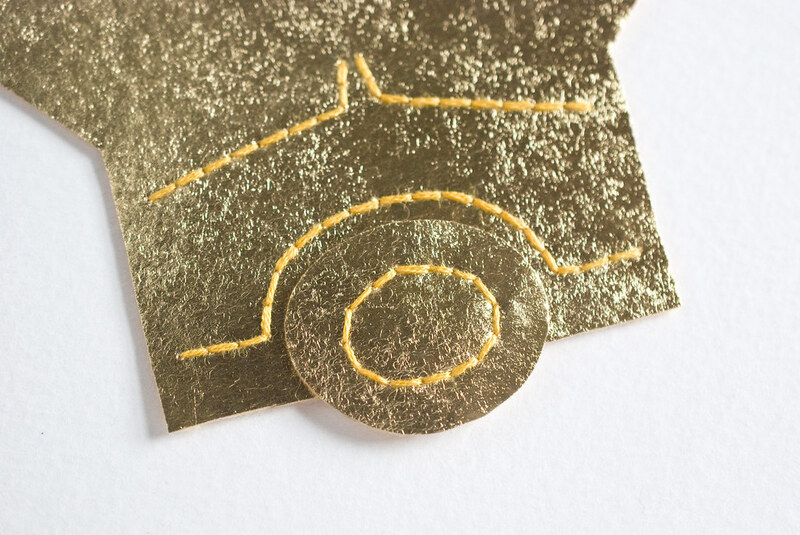 Embroider the details on the metallic pieces, using the tracing paper method. 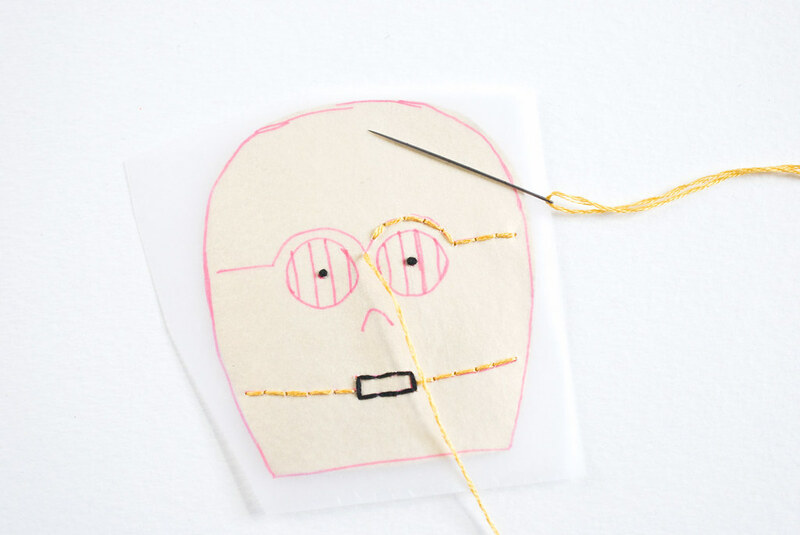 Use golden yellow floss and back stitch for everything but the mouth and the centers of the eyes. Use black floss for those. 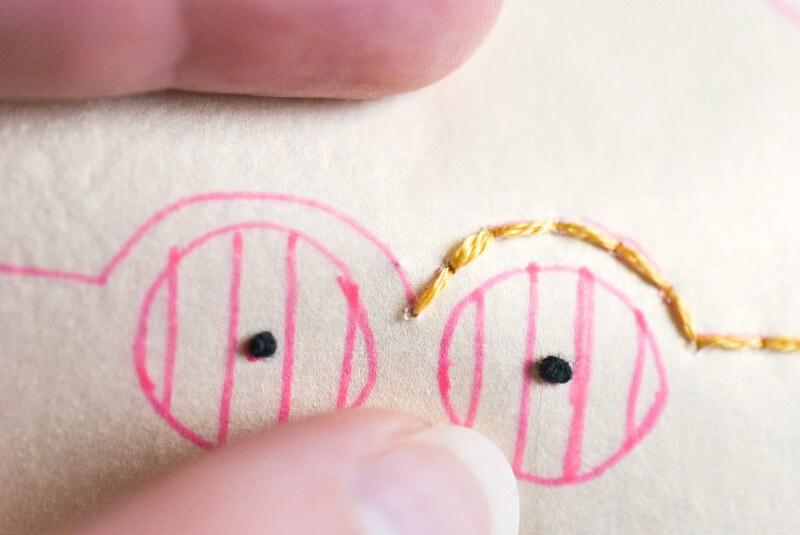 French knots work well for the eyes. For the mouth, I outlined the tiny rectangle with back stitch, then after removing the tracing paper, I filled it with satin stitch. But here's the trick: If you poke a hole through the metallic material, the hole stays there. But if you gently press it from the back to the front, you can see where it will come through before it actually makes the hole. 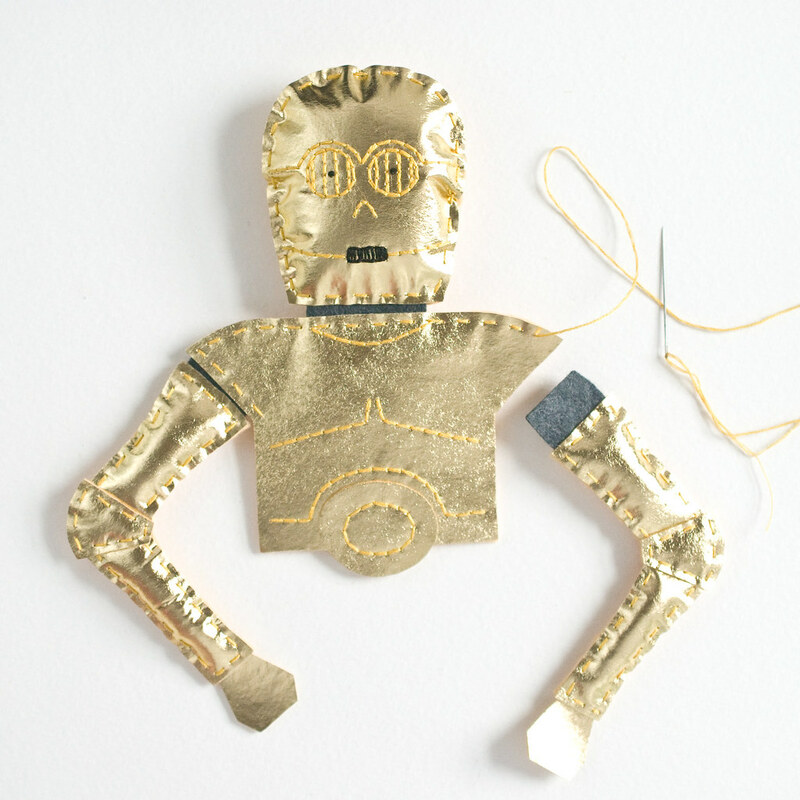 Practice on a scrap of material and then work carefully to avoid making unnecessary holes in your droid. 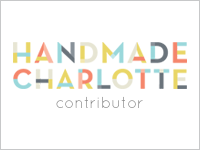 When stitching the small oval, hold it in place over the rounded edge on the torso, stitching through both layers. Embroider the lines on one of the stomach connector pieces with black, light gray, red, and blue for the wires. 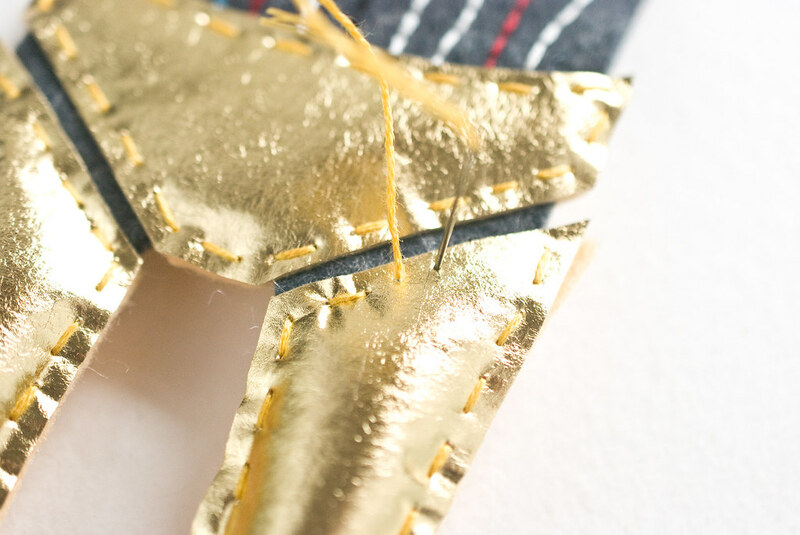 Carefully tear away the tracing paper from all of the embroidered pieces. Now it's time to start putting all the pieces together. Hold the two stomach connector pieces together so that the back of the stitching is covered and so the edges all match up. Sandwich these pieces between the two, um, droid underwear pieces. 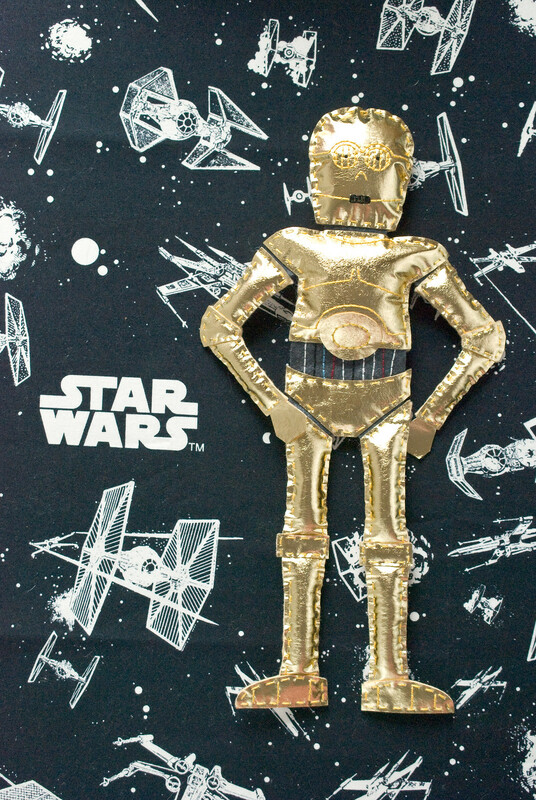 Stitch around the edge of the droid underwear with running stitch and golden embroidery floss. Use the same technique for checking where to poke the needle through without making holes in the wrong places. 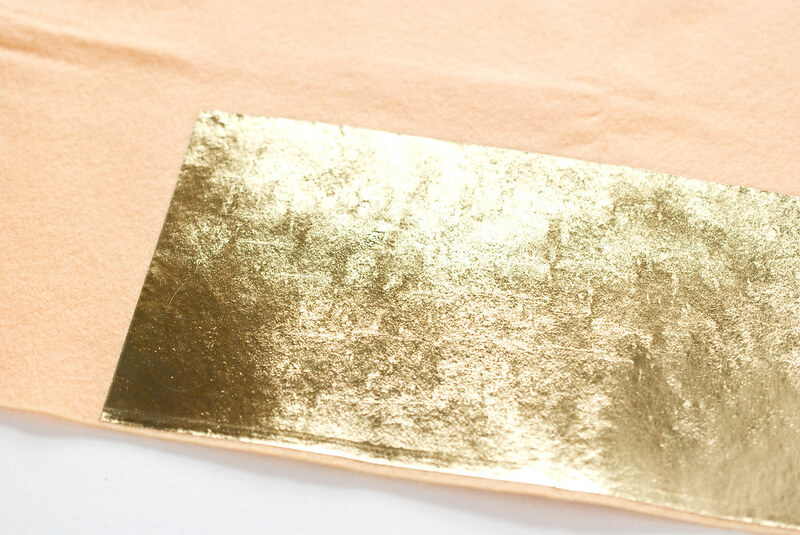 To assemble the arms, layer a metallic piece with a non-metallic piece. Start at the wider end and stitch down one side, place one of the hand pieces between the layers, and continue stitching up to the elbow. Add some stuffing into the forearm, pushing it into place with a chopstick or a thin paintbrush handle. Continue stitching up to the top, leaving the end open and the thread attached. 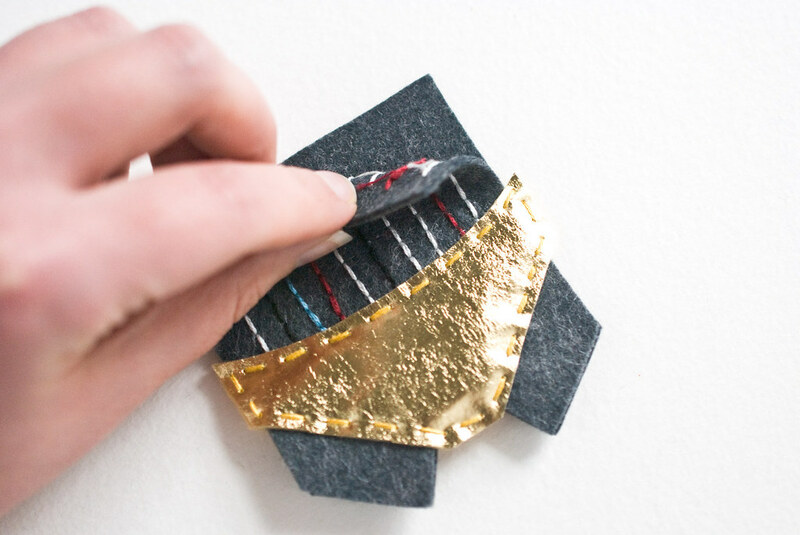 Sandwich a metallic and non-metallic cone-shaped felt piece at the elbow and stitch through all the layers. Add stuffing to the upper arm section. 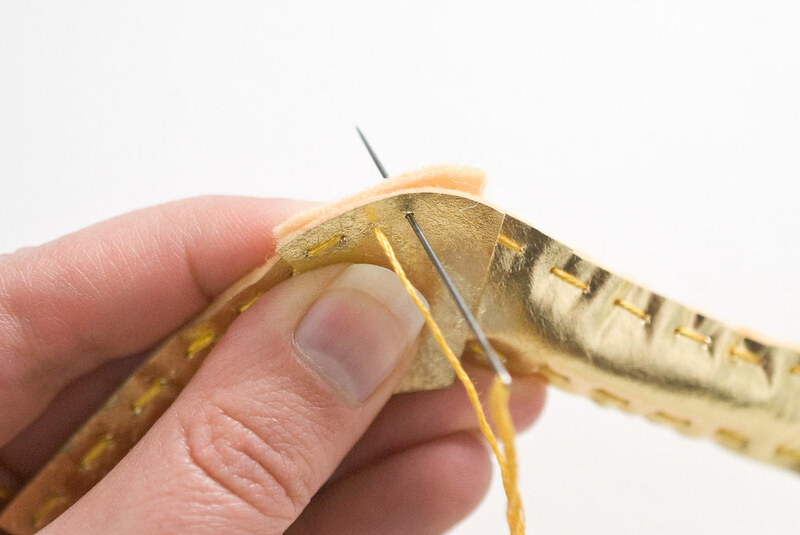 Place one of the shoulder connectors in the opening, with the curved edge toward the outer edge of the arm, and stitch across the opening with the thread that's still attached. I found that going back and forth with this means re-threading the needle a bit, but it goes together easier when you stitch and stuff in sections. Repeat this for the second arm and set them aside. The process for the legs is almost the same as for the arms, except that the feel are two layers, with the end of the leg sandwiched between them. Stitch each leg to the bottom of the stomach connector piece. The angled line of the leg should align with the bottom edge of the "droid underwear", with a small gap. Stitch around the two layers of the head, with the two neck pieces in place between the layers. Add a bit of stuffing inside the head. Starting at one of the arm sockets on the torso, attach the first arm, stitch along the top edge, securing the neck in place, attaching the second arm and going down one side. Place the stomach connector between the torso layers and stitch across the bottom. 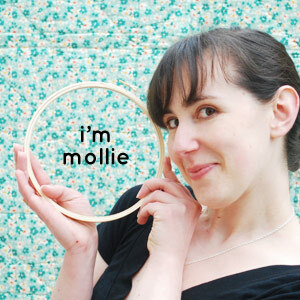 You'll need to gently lift the edge of the oval as you stitch so you don't catch it. Fill the torso with a bit of stuffing through the gap in the side. Then, stitch it closed. 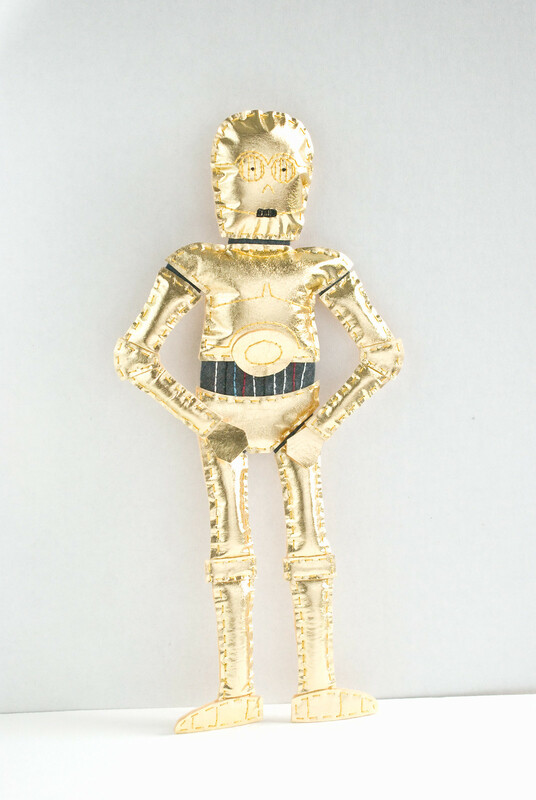 Now your own etiquette and protocol droid is ready to go! I'm not gonna lie, working with metallic coated felt is challenging. But it's so good and worth the effort. 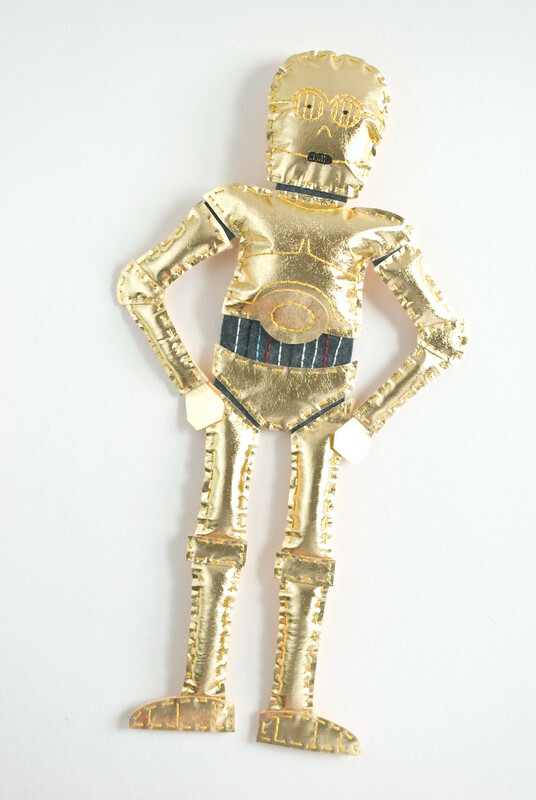 The joints make him a little stiff, which is good for a droid, right? That means he doesn't sit very well, but he will stand when propped against a wall. I love it! 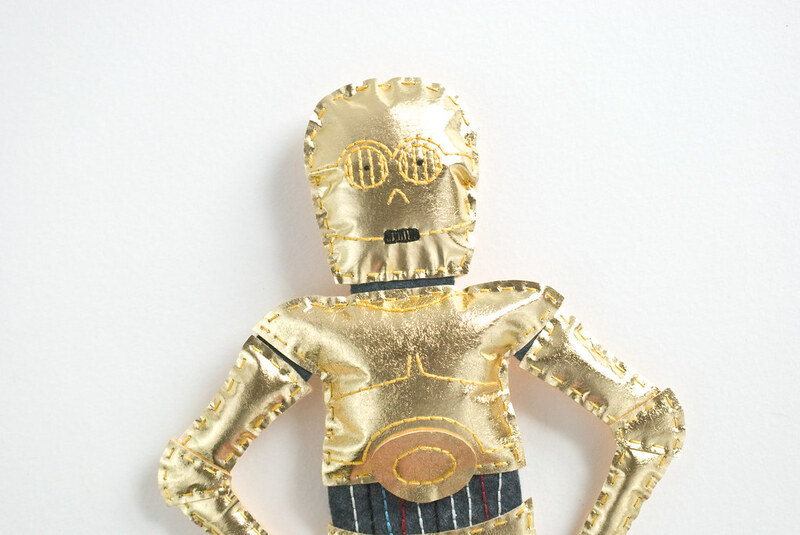 And now C-3PO joins the other characters and creations in my Star Wars DIY collection! NOTE: This character is copyright Disney/LucasArts, and I'm only sharing this pattern as fan art. Please do not sell items made with this pattern. This is so awesome that I made an unrecognizable "HURGHGH!" or surprise when I opened this page. Love it. May the Fourth be with you! Wow. May the Fourth be with you! 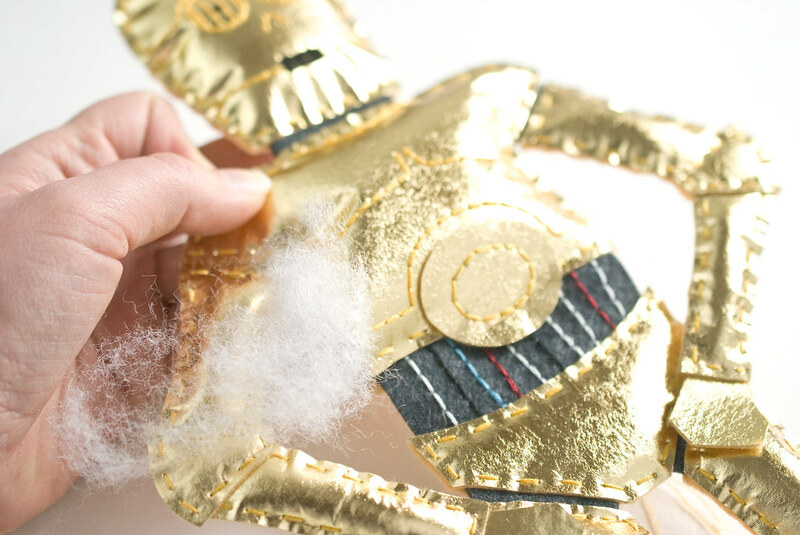 OH MY GOODNESS I DIDN'T KNOW I WANTED A STUFF CHEWIE CARRYING BITS OF C3PO UNTIL RIGHT NOW. sorry for the yelling but i am that excited!! What an awesome project and finish! 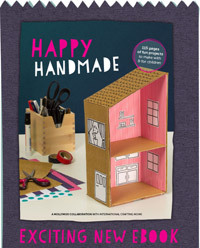 Not sure if I am for this one as I would have to make 3 dolls for the munchkins in my life. Ouch! That would definitely take a bit of work! 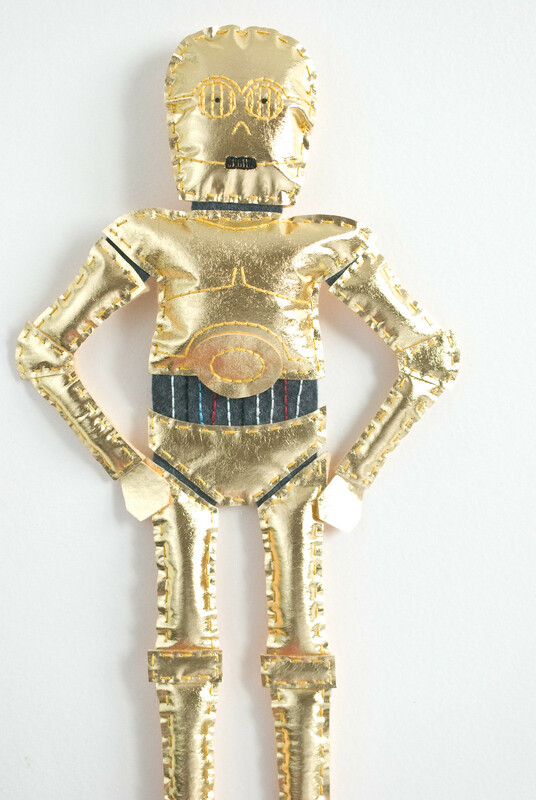 It would be faster if you skip the metallic part and just make him all yellow. 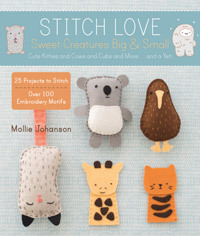 And if you're better at small sewing on a sewing machine, I think it would work to do it mostly by machine. Gah! I want to take him home and carry him everywhere with me! Love it! Such a great tutorial, too! Very easy to follow. 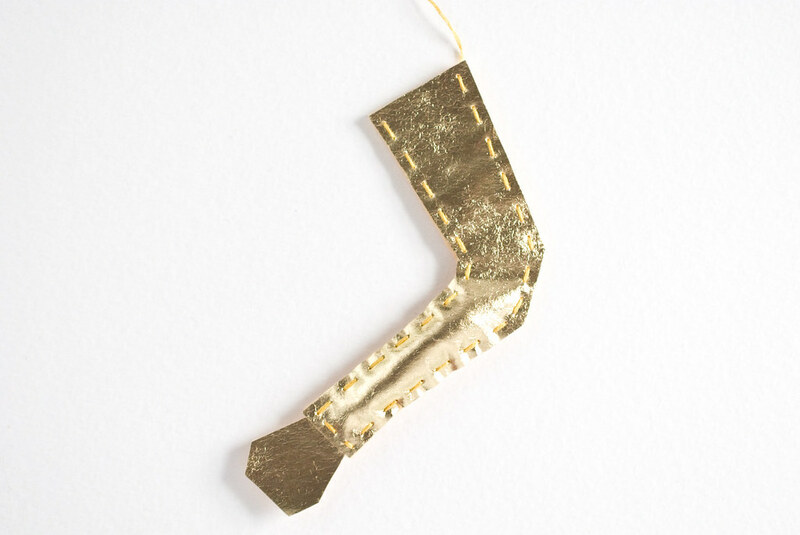 Definitely going to look into the iron on metallic gold material. How cool!